Pfister Pfirst is one of the best in the business if you are looking for faucets that are some of the most practical upon the market. In this review, we will go through all the details of each feature that Pfister has. As seems to be a trend with the pull-out class of kitchen faucets, this offering from Pfister is made of a base material of brass but has a stainless steel color and stainless steel finish. Design-wise it’s classified to have a basic style, which is perhaps an accurate description, but there’s nothing basic about how it looks and functions in the foodie’s domestic kitchen. 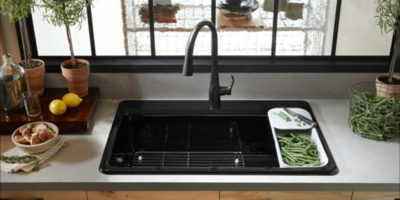 This pull-out faucet just screams “foodie” in every sense and there’s no wonder why people who really love to cook prefer this type of design. The rounded spray head is somewhat refreshing and different and it looks more like something you’d use for cooking tasks (like de-starching rice, washing veggies, etc) rather than for cleaning pots and pans, but it’s just as effective for the washing up as well. Pfister barely got it right with the design but they did well because the styling just simply works. It’s almost as if the rounded shower head was the much-needed stroke of design genius which set this faucet apart from a water outlet you’d find in the bathroom of a commercial establishment. It’s perhaps just the rounded spray head which makes all the difference because it really would look out of place in a bathroom, looking great in the kitchen where it belongs. Definitely a great replacement for an older faucet with the type of artistic element that will literally add value to any property. This faucet has a water consumption rate of 2.2 gallons per minute, which translates to a water flow rate of 1.8 gallons per minute. One hole is narrow/wide enough to spew water at a good pressure and the single lever-type handle is center-set. The spout’s elegance is perhaps drawn from its curvaceous shape, while the handle is rather solid since it’s made out of durable brass, although coated with a chrome finish. This is the cheapest of the featured pull-out faucets (the best ones that are) but by no means is this an indication of any lack of quality. It weighs 4.8 pounds with dimensions measuring 20.8 x 12.5 x 2.9 inches, some info which will come in handy for installation. The installation method is a deck-mounted one and you’ll be able to fit it into most one/three-hole sinks since it comes inclusive of a deck plate. This faucet comes with a deck plate, which is very handy because it makes it fit just about any type of one/three hole sink. The sprout has a high-arc profile which gives the user ample clearance and reaches, a feature which works very well with the functionality of the 180 degrees swivel achieved. 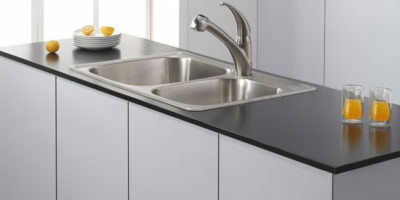 Great access all around the entire sink, so no positioning and repositioning of whatever it is you’re cleaning, filling or rinsing. There’s a 38-inch pull-out hose made out of tough stuff, nylon, which means it’s not only strong but also very flexible, quiet to operate and it has a conveniently integrated toggle-button which is used to change between the stream modes or spray modes. It all happens very seamlessly as well. 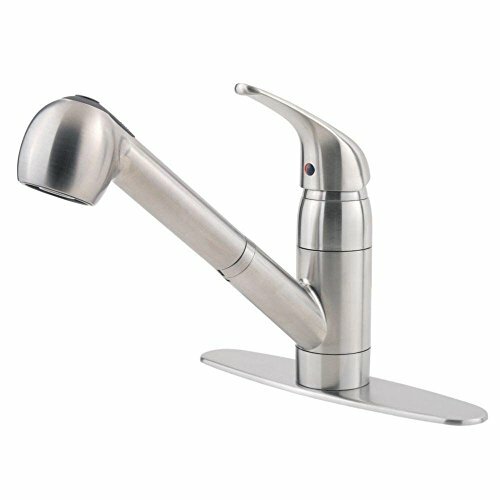 This faucet features a good value that operates without any leaks and it opens and closes easily as well. 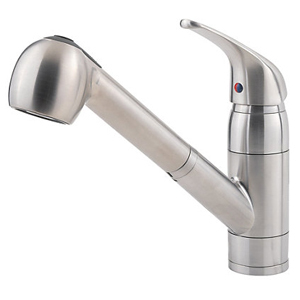 The feel of the faucet is that of a unit which is very well-assembled, whether you’re holding it in your hands prior to mounting or indeed if it has already been mounted and you’re busy operating it without much thought really. The operation runs very smoothly and this applies to all its features and functions. 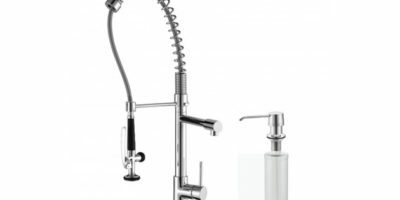 Going back to the visual appeal, it’s perhaps a matter of preference, but the spray hose could perhaps look a bit better, but then again any tweaking and tampering of this rounded shower-head type design would probably make it look like it belonged in a bathroom as opposed to the kitchen. That said, in terms of functionality this design works perfectly. 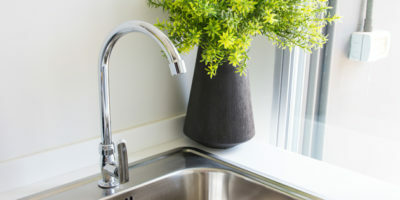 It features some black-meshing which makes it conveniently light, something you only really notice if you’ve perhaps previously had an older faucet installed or if you just have another one to compare this one with – one which would otherwise have a connector hose made of steel. The aerator and the sprayer both function well and get the job done, while the sprayer boasts some flexible bumps which make it easy to clean. The aerator pumps air right into the solid water stream, which somehow makes the water taste better, for some reason. Since the brass is of high quality and is nice and solid, you can pretty much count on never having to cash in on the lifetime warranty which comes with this faucet. The supply lines are solid and strong since they’re made of nylon and, as mentioned, the texturing makes it easy to clean.